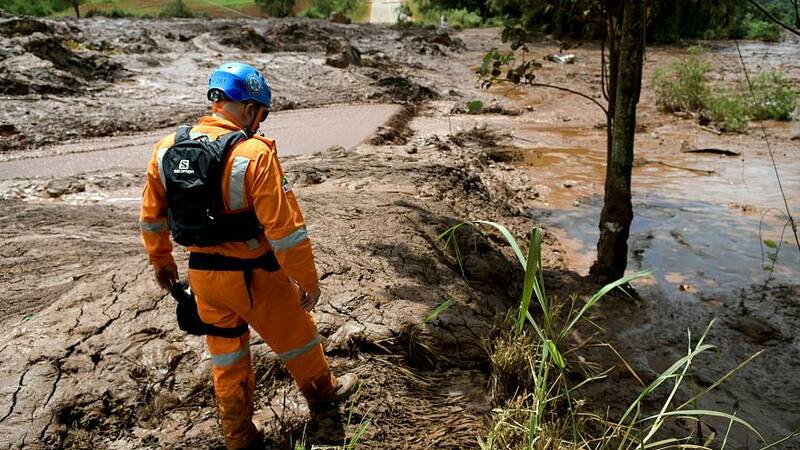 Rescue workers in Brazil are searching for survivors after a dam at an iron ore mine was breached. Hundreds of people are still missing. The dam, situated near the town of Brumadinho in the Brazilian state of Minas Gerais, was burst on Friday. 300 people are still missing and 370 have been rescued. It is not yet clear what caused the failure of the dam, which is owned by Vale, Brazil's largest mining company. Only a small number of the victims has so far been identified. The disaster comes only three years after a similar failure of the Fundão Tailings dam near Mariana, which was co-owned by Vale. Brazil President Jair Bolsonaro, who flew over the disaster area in a helicopter on Saturday, tweeted that it was hard not to get "emotional" after seeing the scale of the devastation. The local fire services have commented that they don't expect to find any more survivors.